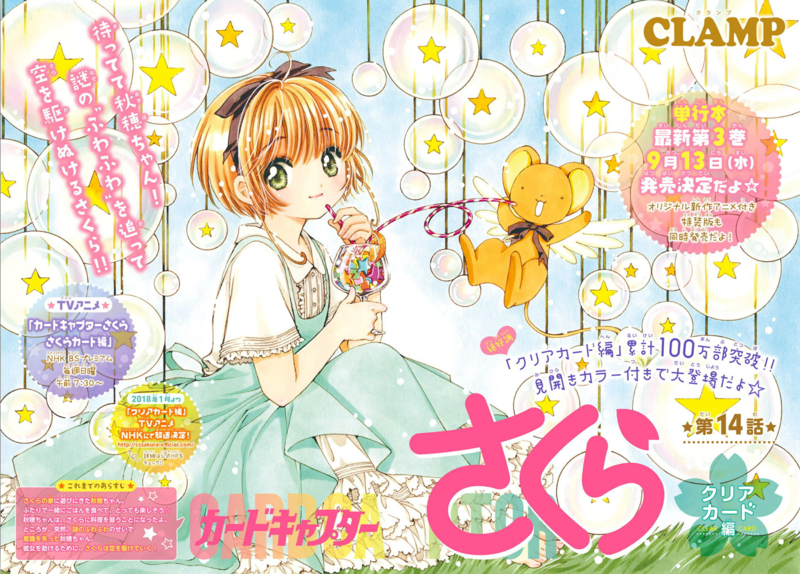 The title page is lovely, and as Card Captor Sakura as it gets, but Sakura still looks like a elementary school student u.u Glad we’ve got a spread after so long (? can’t remember when was the last time). So FLIGHT seems really energetic, the most energetic Clear Card we’ve seen so far. It reminds me a lot of Kuda Kitsune. So new card is called SNOOZE and it is as obvious as that. Yuna looked so happy/relieved to hear that Sakura is treating Akiho well. As if this is something of importance to him or her. So Sakura is felt something strange/off when she was securing SNOOZE. Was it because of the card or was it because of Akiho? Either way, I believe it’s the first time she uses that word. I don’t think she ever used the word “presence” (kehai) for the clear cards? Please someone correct me if I’m wrong, I really can’t remember. We finally get to see the new cheerleading squad uniforms and they look nice (though still quite similar to the previous one). Look, it’s Chiroru! Someone (a reader) pointed out that Touya and Yukito had been working part-time there but I believe this is the first time we’ve seen the shop itself. I love Touya’s mascot outfit — so cute! And Sakura is so lucky to get baked goods from Chiroru~ I want some too! Well, that is, considering she manages to enter the shop since it appears that another card has showed up, and it looks a lot like The Maze or even The Dream, as some people pointed out. Is this one going to be LABYRINTH? 29 pages for this chapter — Chapter 13 was likely the last chapter of volume 3 and this was likely the first chapter of volume 4 (we even got a color spread to backup that theory). YAY my favorite time of the month, at last!!! That color spread IS SO LOVELY! I fell in love with it the moment I saw it….so summery, so lighthearted..! But yeah, Sakura still looks so young here! You gotta love the fact that Sakura is pottentially swearing! HAHAHAHA I have to admit that the temptation to believe she’s swearing is soooo damn strong , because come on…it would be such a change from the sugary sweet and well educated Sakura xD It makes me laugh to no end! But it’s probably as Jai says, she’s talking incoherently because she’s being tossed at high speed xD I’d start a contest though! Fill those symbols with the worst imprecation you can imagine!!! OH YEAH, watch as they find the mysterious book Akiho is looking for, in that library….that library is The Library! About the “kehai” word, I have the same feeling she never used it, yes. Look, it’s Chiroru! Someone (a reader) pointed out that Touya and Yukito had been working part-time there but I believe this is the first time we’ve seen the shop itself. Nope, it seems like everybody forgot about it, but we all said the same thing in chapter 5, when Chiroru’s shop first appeared! XD I remember it well! Ne ne! Isn’t that Toshihiko?? The kid holding onto Touya as a mascot character?? About the last pages, well I wouldn’t exclude it’s Sakura entering the dream state again…but we’ll see! Last thing I have to say about this nice chapter: WHERE IS THE PREVIEW OF VOLUME 3 COVER??? WTF? I guess it could be either… it’s up for interpretations xD The first thing I thought was that she was swearing, though. I looked that chapter over and you’re right! Lately CLAMP have added so many crossovers that I lost track of them. And it’s no longer a big event when they appear xD So I guess Chiroru can be considered their *official* part-time job. I THOUGHT SO TOO, but we can’t really see his little X scar on his face, so I don’t know… The hair is totally the same, though. I hadn’t thought about that.. you could be right! OMG I completely forgot about that?! (being busy and all) that was a surprise! Nakayoshi usually has the exclusivity! I guess we’ll have to rely on other sources. That spread is definitely beautiful, CLAMP did a good job with it this month, and I’m not unhappy at all that we didn’t get an SxS color page since chapter 2, not even for their first date hahaha (dry laugh). But it really is cute, I really love it! 😉 And she does look older in my eyes: she is sitting so we can’t tell how tall she is, but her facial expression is more calm and serene, unlike the many pictures in which she is got a huge open smile in super genki mode which makes me feel she is younger haha (not that I dislike it mind you!!). They also stopped making her wear pigtails! I’ve been thinking for a while that it really didn’t feel like Akiho knew anything about Sakura and her magic, and this chapter seems to be going in that direction again, making me think that the butler might be the one in the know after all. We finally see Sakura’s new cheerleader uniform, they are nice! 🙂 It’s cool to see them train and have upperclassmen advising them too! It was weird to see Chiharu being able to so the same moves as Sakura, somehow in my mind, Sakura’s sport abilities were way above all classmates but indeed! Chiharu has been on the cheerleading club all these years too!! I never thought for a second it would be a card in the end though: I immediately thought “She went inside the Dream World again!” the moment I saw that scan haha~ And I’m quite excited about it really: all this time, she made very short visit there and it was pretty much about short encounters that were cut off abruptly with the cloaked figure, but this time around, it seems like she will actually move around the Dream World and explore it! I can’t wait to see what she will discover and who she might meet in there! 😀 That’s what a call a significant event at last! Sorry about the delay, I had written a long response to your comment a couple of days ago but WordPress simply lost it and I couldn’t find the time and will do do it again but here we go! and I’m not unhappy at all that we didn’t get an SxS color page since chapter 2, not even for their first date hahaha (dry laugh). oh my god, I had no idea it had been that long! Give us a new S+S color illustration, CLAMP, c’mon! making me think that the butler might be the one in the know after all. Some reader wrote that Yuna knows something that Akiho doesn’t and I think I agree with you both. 2) Akiho — but then again, she doesn’t feel it all the time? Like, during school. 3) Yuna — most likely the culprit here, since it’s only the second time Sakura sees him. Let’s wait and see what she feels the next time she sees him. Thanks for the tankoubon summary, it really feels like this was the first chapter of volume 4. Volume 3 was long overdue. i really really enjoyed this chapter! kaito somewhat reminds me of a cross between subaru/ eriol. i liked his coat too. the cheer leading scene made me think of the anime episode where mei ling and sakura have a little “anything you can do i can do way better” gym battle. lmao i wish mei ling was in the manga, i love her feisty temper. she completely counters the fluffy sakura perfectly. i wonder if yukito/yue will ask sakura to stay round at their house whenever touya and fujitaka are staying at the uni over night. I miss Meiling too and let’s hope she will come back for the anime! She does give a nice balance to all the cuteness in the story. i want to know what touya is studying! Yuna comes for Akiho, he has different clothes, so it’s not like he’s the same as Yue. His shoulders look wider this time, but maybe it’s a padded coat. We see Akiho brought Momo with her, the “plushie” was there while Sakura was Card cahsing. sakura starts to feel the cards’ oddness, she’s growing more powerful. The new cheerleader uniforms are cute, but Tomoyo and Akiho still have their winter uniform, we still haven’t seen the summer ones. I wonder when we get to it. I think because Chiroru didn’t exist back then xD I don’t remember him working twice on the same place. I wish they would work at Green Drugstore!